A while ago I decided that I would go and get myself a Bike fit, I've heard lots of positive feedback from various people on twitter, and on cycling podcasts about Bike fit, so I thought I would give it a go. It's worth mentioning at this point that I am no 70kg skinny racer type, I do ride a road bike, quite a fancy one at that, but I am certainly more than a couple of stone above what might be considered a 'racing weight'! I spend lots of time on my bike, and I cycle a lot of miles in a year, I commute (slowly it has to be said) between 15 and 32 miles every day. I also enjoy the occasional 50 mile'er at the weekend. So getting my position on the bike right seemed a worthwhile thing to do. 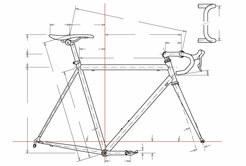 OK, so what does Bike fit involve? I got my Bike fit done at The Tri Centre in Edinburgh (http://www.thetricentre.com/) who use the Bikefitting.com (http://bikefitting.com) method. It costs £35 for a standard fit, and £50 if you want your bike adjusted to the new set up by Tri centre staff (plus cost of any required bits). If you get a bike fit for a new bike and buy it from the Tri Centre, you get the £35 refunded. I decided on the £50 option, and got my bike set up in store. The fitting process is a fairly straight forward one, you stand on a jig which measures various bits of your body (full info on measuring can be found on the bikefitting.com website), the measurements are then plugged into a computer which then spits out your ideal position on the bike - frame size, saddle height/ relative position over bottom bracket, reach, ideal handle bar width, ideal cranklength etc. It is fair to say that the system is a fairly formulaic one, there wasn't much attention given to my current position or riding preference, although we did settle for a slightly different handlebar position from the diagrams given my preference for a slightly flatter set-up. In the end the total cost for the fitting was £65 including a cheap but it has to be said perfectly good Deda quattro stem. So would I recommend you go out and spend your hard earned cash on a Bike fit? I think the answer is a definite yes! It has been a couple of weeks and a couple of hundred miles on the bike since the fit, and although I still need shorter cranks to complete my ideal set-up, the bike is definitely a more comfortable place to be. My saddle position on my old set-up was completely wrong, 2cm too far back in relation to the bottom bracket, and 1.1cm too low. The overall reach to the handle bar was correct on the old set-up, but I always found it difficult to ride on the hoods, it always felt stretched and I often suffered from tired neck muscles as a result. You might think a couple of centimetres here, and a couple there can't possibly make that much difference, but it so does! The new position is one where I am in the correct position over the bottom bracket and so pedalling downwards, rather than forward and down which is much more efficient. Although my overall reach is still the same, because my position over the bottom bracket is correct, my body angle is less acute and I can now comfortably ride on the hoods without any neck strain, I also have a better feel for steering the bike because of the longer stem. What you really want to know though is does this new position make me go any faster? NO, but as I said earlier I am not that skinny 70kg racer type, but improving comfort was what it was all about for me.